NASSAU, The Bahamas -- Officials from the Urban Renewal Commission, the Department of Gender and Family Affairs and the Ministry of Social Services and Urban Development, saluted 29 female, urban community leaders from across New Providence for their contributions to community building, Friday, March 8, 2019. 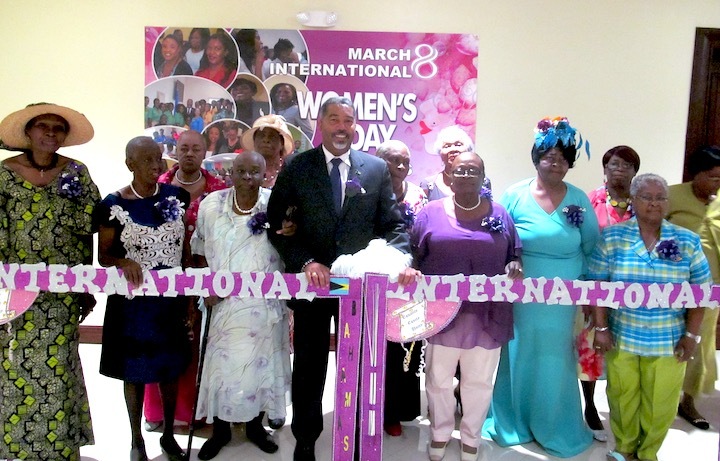 The Awards Ceremony and Luncheon took place at the National Training Agency, Gladstone Road, and was held as a “significant part” of the activities surrounding The Bahamas’ observance of International Women’s Day. International Women’s Day is a global observance that is celebrated annually on March 8, in the 190 Member States of the United Nations to highlight the achievements of women, while reflecting on the issues and challenges that women and girls face worldwide. The Awards Luncheon was one of several activities that took place Friday. Other events included a number of school assemblies facilitated by staff of the Department of Gender and Family Affairs; a Training Seminar focusing on International Women’s Day, facilitated by the Department of Gender and Family Affairs and hosted by The Bank of The Bahamas, and a Mentor/Mentee Conference with Dame Janet Bostwick that was hosted by the Ministry of Youth, Sports and Culture. The Royal Bahamas Police Force also staged activities commemorating International Women’s Day on Friday. Events were also held in the lead-up to IWD, Thursday, March 7. These included a Two-Day Signature Event hosted by the National Congress of Trade Unions; an Informational Pep Rally for Administrators, staff and students of The University of The Bahamas, and a Strategic Stakeholders Luncheon, hosted by the National Women’s Advisory Council. Friday’s honourees were selected from urban communities such as Bain and Grants Town, Centreville, Englerston, Fort Charlotte, Fox Hill, Free Town, Nassau Village, Pinewood Gardens, St. Barnabas and Southern Shores. 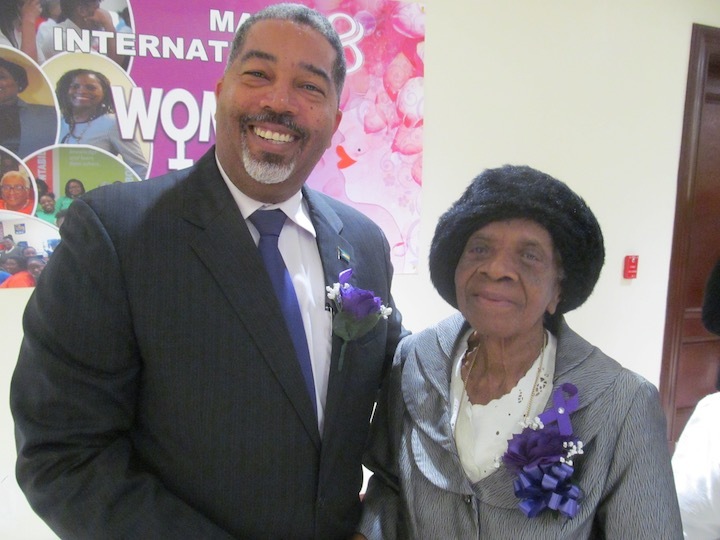 The honourees were: Mrs. Iris Demeritte, Ms. Mary Scott, and Mrs. Iris Ingraham (Bain and Grants Town); Mrs. Naomi Bain, Ms. Prescola Roberts and Ms. Mary Ambrister (Centreville); Ms. Anita Miller, Mrs. Geneva Rollins and Ms. Susan Hunt (Englerston); Ms. Hynah Beverley Major, Ms. Eleanor Musgrove and Ms. Miriam Jones (Fort Charlotte); Ms. Sheila Knowles, Ms. Miriam Roker and Reverend Julia Bain (Fox Hill); Ms. Phillipa Taylor, Pastor Irene Russell and Ms. Paulamae Miller (Free Town); Ms. Patrice Wendy Morley, Ms. Catherine McKenzie and Ms. Jennifer Rolle (Nassau Village); Ms. Shirley Evans, Ms. Beryl Elliott and Ms. Mizpah Armbrister (Pinewood Gardens); Ms. Vernice Paul ad Mrs. Muriel Thompson (St. Barnabas), and Ms. Lillis Ramsey and Ms. Pearl Bullard (Southern Shores). Ms. Olive Collie was also among the 29 honourees. Women from across a wide spectrum attended Friday’s Awards Ceremony and Luncheon including those from the political arena, the unions, community associations and a host of non-governmental organizations (NGOs). “Today, we applaud and salute 29 hardworking, outstanding women of The Bahamas for their tenacity and strength. These women have poured out their spirits, their love, their generosity and their talents into urban communities here in New Providence,” Minister of Social Services and Urban Development, the Hon. Frankie A. Campbell told the packed room. Minister Campbell said Bahamian women have made, and continue to make, contributions to nation building. “We are justifiably proud of the many achievements of Bahamian women in all sectors of our society and today we encourage all Bahamians to join us in celebrating these accomplishments,” Minister Campbell added.